Calcium hypochlorite is one of the widely used chemicals for water sanitation across the globe that helps prevent water related diseases such as cholera and typhoid. It is extensively available across the globe and is also used for cleaning public pools. Calcium hypochlorite offers a favorable cost-to-performance ratio, as it provides protection from germs and is cost effective. Most of the calcium hypochlorite available in the industry has 60% of chlorine content by mass. Apart from water treatment, calcium hypochlorite is employed in various applications. These include house cleaners & detergents, agrochemicals, pulp & paper, food & beverage, and others. The global calcium hypochlorite market is expected to expand at a significant pace driven by the increase in demand in the water treatment application. The calcium hypochlorite market was valued at about US$ 5 Bn in 2017 and is projected to expand at a CAGR of more than 3% during the forecast period. According to the World Bank in 2016, 783 million people across the globe lacked access to safe drinking water, 2.5 billion people lacked adequate sanitization, and large percentage of hospital beds were populated by people afflicted with waterborne diseases. At the current rate, 90% of all available freshwater is expected to be consumed in the next 25 years. Consequently, desalination and water reuse is likely to become a vital source of freshwater. Currently, more than 16,000 desalination plants are operational in at least 140 countries in the world. More than 100 water reuse facilities are available across the globe. These facilities require reliable disinfection technologies, including calcium hypochlorite either in pre or post-treatment form, to prevent biological fouling within the system or the distribution system. Thus, increase in demand for fresh water and decrease in its sources are anticipated to boost the demand for calcium hypochlorite in the near future. Companies need to primarily focus on the marketing strategy of their products in order to increase their market share. Furthermore, manufacturers need to expand their sales force by increasing and strengthening their distribution networks. Companies also need to focus on competitive pricing, since players such as China Petrochemical Corporation (SINOPEC), Tosoh Corporation, Lonza Group Ltd., Nippon Soda Co., Ltd, and Westlake Chemical Corporation have integrated their operations. 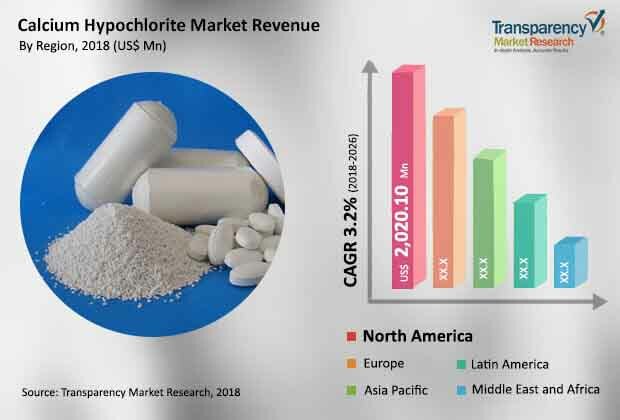 Major players in the calcium hypochlorite market have adopted expansion and merger & acquisition as their key strategies to expand their network. For example, in March 2018, Tosoh Corporation established a new holding company named Tosoh China Holdings Co., Ltd. (Tosoh China) in Shanghai, China. The new company is expected to help Tosoh Corporation strengthen its position in China. In September 2015, Tosoh Corporation acquired the remaining stake in the Philippines-based chlor-alkali manufacturer Mabuhay Vinyl Corporation and made the company its subsidiary. The acquisition is estimated to help the company strengthen its position in the market. Acquiring small players to maintain high market share is likely to be a long term strategy of calcium hypochlorite manufacturers. For example, in August 2016, Westlake Chemical Corporation acquired Axiall Corporation for US$ 33.00 per share in an all-cash transaction for a total value of US$ 3.8 Bn. The acquisition is likely to strengthen the company’s position in the calcium hypochlorite market in North America. In terms of form, the calcium hypochlorite market can be segmented into powder, pellet, and granules. The powder segment is anticipated to account for the major share of the market in terms of volume. The large share can be ascribed to the cost effectiveness of the powder form with respect to other forms. In terms of application, the calcium hypochlorite market can be divided into water treatment, house cleaners & detergents, agrochemicals, pulp & paper, food & beverage, and others (including algae control in industrial cooling water systems and general industrial sanitizations). The water treatment segment dominated the calcium hypochlorite market in terms of value and volume in 2017, due to the extensive use of calcium hypochlorite in swimming pools across the globe. North America and Europe are the key regions of the calcium hypochlorite market with prominent shares. Asia Pacific is estimated to be a rapidly expanding region of the calcium hypochlorite market in the near future owing to the strong research and development activities in Japan, China, South Korea, and India. Water treatment and house cleaners & detergents applications are focus segments in Asia Pacific, owing to the rapid urbanization in developing economies such as China and India. Key players operating in the global calcium hypochlorite market are China Petrochemical Corporation (SINOPEC), Tosoh Corporation, Lonza Group Ltd., Nippon Soda Co., Ltd, Westlake Chemical Corporation, Sree Rayalaseema Hi-Strength Hypo Ltd., Tianjin Kaifeng Chemical Co., Ltd., and Yuzhoushi Weilite Chemical Co., Ltd.